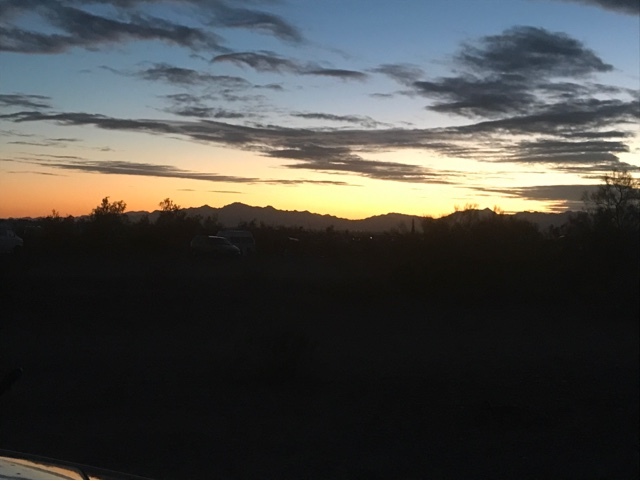 I went back and played the Sidewinder Disc Golf Course in Quartzsite this AM, as my toe still hurt from the blister I got walking and there were rain showers again on and off. I played as good a game as the other day, finishing well under par. This is my new feel good course. 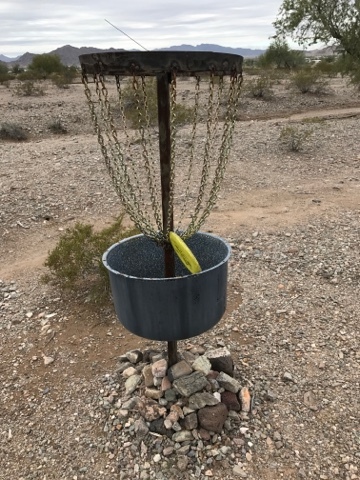 I had two discs hang on these non-regulation baskets but I gave myself the point anyway. I headed back to the RTR around noon after a quick stop at the Roadrunner Grocery Store for some fruit. I then joined a number of others picking up trash and things left behind. Above is a rear wheel (spare) cover that appears to have been left behind. 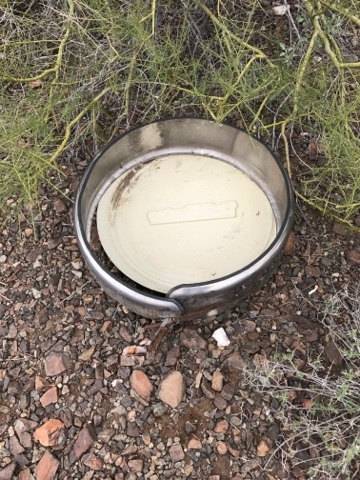 I checked it out and it appeared functional so I assumed someone would be back to look for it. I filled up a plastic grocery bag with rubbish and dragged a plastic awning cover that was broken from before the RTR. Also 2 4'x4' 1/2 ridged foam pieces that were left at a site. We made a pile and met Bob Wells who was taking the trash to the dump today while it is open. As the sun set tonight I estimate that there are still about 15% of us that have remained for a day or two. I plan to move on to new adventures Monday or Tuesday.